I needed an excuse to play with my newest craft toys and supplies so I hid in my craftroom for a few hours saying, " I'm working on my thank you cards". This first thank you card has the head of the girl sticking up because I realized that if I centered the figure the flowers would block the words. The words couldn't be moved because I started with a pre-made plain thank you card. (I bought the cards in bulk when they were on sale.) Anyway, after coloring the girl with markers the back of the paper showed the marker ink so I couldn't just glue her down. I decided to trace the top of her head on the back of the card and use a craft knife to cut it out. Next I folded up the head top, glued the girl to it and put some pop dots behind the rest of her body. On the original rubber stamp the girl was holding roses but didn't like them or the way that I colored them so I covered the flowers with stickers that I found at Craft in the City. The lace border was made using a new Martha Stewart punch. The butterfly was also made using a MS punch and a sprinkling of glitter. This second card also started with a rather plain pre-made card that had some glittered accents. I liked the sassy girl image. I put her on pop dots so she would stand out even more The Spellbinder dies were used to frame the rub-on words. Silver Stickles (sorry the camera didn't catch the sparkle) and flower brads were added for more bling. Both of these cards were simple to make, but more importantly they were fun to create. If you make your own thank you cards you can tailor them to the recipient and it makes writing thank you notes more enjoyable. 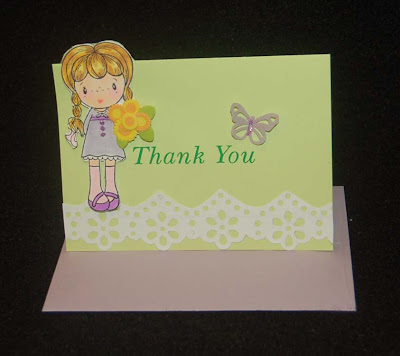 A handmade thank you card says, "THANK YOU" loudly so it won't even matter if you are not an eloquent writer. Now, get going with those thank you notes.....don't put it off.....MOM said so! 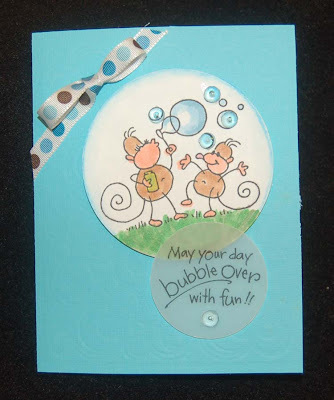 Most cardmakers have seen the dewdrop or water droplet acrylic bubbles for sale in little bottles or containers. I purchased some awhile ago and so I was surprised to find giant bags of the stuff in the Craft in the City store (Bishop St.). It was there that I learned that the Hilo store also just got a supply. The bags are so large that I decided to repackage them (for the Hilo store) into smalller bags of two colors so that paper crafters can afford to get several colors. I love these fun little bubble dots because they come in juicy colors that seem to glow. Be sure to get some to make champagne bubbles on your New Year's Day cards. This year I resolve to tidy up my craft room (and the WHOLE house) before starting on Valentine projects. (I love hearts so I can't wait to use all the new Valentine items coming to the stores.) I wish you the best in 2010 and hope that crafting will prosper in your life this year! Stay healthy and you will be happy! I realized that I didn't use this jumbo snowman clear stamp set (Stampendous) that I purchased from Craft in the City (Bishop St.) and Christmas is this week! Since I needed one more Christmas card and wanted to give out another cookie bag, I decided to see what I could create with this fun stamp set. First of all, I want to caution you to carefully remove the stamps from the acetate sheet because I broke the thin outer line of the snowman......not to worry, it can still be used. Anyway, the fun technique of piecing (shown by Cheryl on the Joy of Crafting) was used on the snowman with the red scarf. I had a scrap of flocked ribbon lying on my desk and stamped the scarf on it. 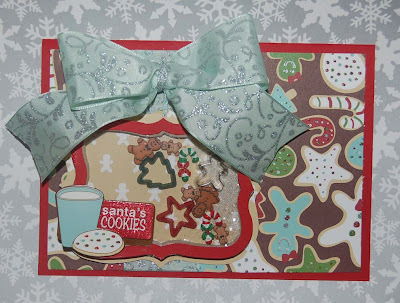 The ribbon scarf added lots of texture and color to the card.....easier and better than coloring. I added a real jingle bell to the cap and glued on a shiny plastic candy cane. The other card has a snippet of a mini garland and 'Let It Snow' ribbon for texture and movement. Finally, the cookie bag used a MS corner punch to accomodate the ribbon handle and the blue gauzy snowflake ribbon scarf was used to close the bag (through holes made with a bookbinder screw punch). All the snowmen were colored minimally with markers and then glittered.. In an earlier post I announced that Lorna was the winner of our Christmas giveaway. I also announced (in the same post) that we decided to award five extra $10 gift card prizes. So far none of these five winners have sent us their mailing address. Without your mailing address we cannot send you your prize. Scroll down to the Dec. 12th post to see if you were one of the gift card winners and to learn where to send your address. Today I realized I had not used a the 'Three Penguins' Hero Arts rubber stamp that I bought at the start of the holiday season. Since I needed two special cards to announce gift magazine subscriptions, this seemed like the perfect opportunity to use the stamp. Also, I finally discovered why I was having such a hard time getting the MS border snowflake punch and corner punch to line up........there are specific dimensions for the paper (listed on the instructions included with the punches).......duh! That's what happens when you automatically throw away any instructions before reading them. I stamped the penguins and embossed them with black embossing powder to give them a wet look. 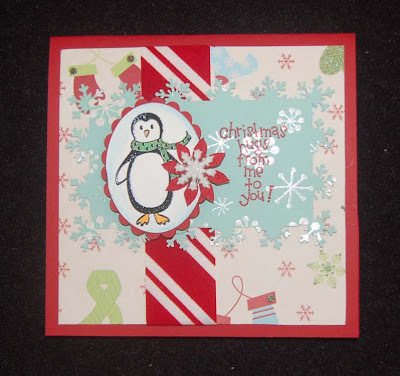 The Spellbinder oval die and scalloped oval were used to cut out just one penguin and the red frame. A part of the other penguin showed so it was covered with the Hero Arts felt poinsettia and Darice snowflake. Imaginisce decorative paper was used for the background and the Dandelion Design word stamp was used with red Staz-on red ink (because the blue snowflake paper had glossy snowflakes which would not accept regular ink). I liked the peppermint flocked ribbon because it matched well with the poinsettia. 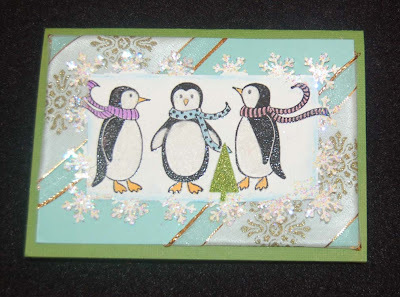 This second card was also made with the HA penguin stamp, the MS snowflake punches, wide garland ribbon, and leftover paper. A Making Memories glitter foam tree sticker was used to cover an ink smudge. Another ink smudge on a penguin front was disguised with white Stampendous Fun Flock. I almost never throw away a less than perfect image or card. There is always a way to cleverly hide the 'happy mistake' or re-purpose the parts. If you're done with all your Christmas shopping and wrapping......hurray for you! Start making your cards and decorations for next year before putting away all your pretty, sparkling holiday craft supplies. Thanks for reading this loooooong post and if you are one of the $10 gift card winners please contact us. This year I decided to try making some treats other than cookies. 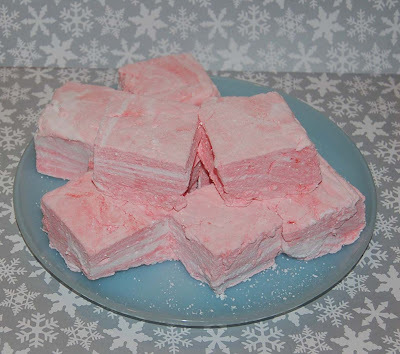 Martha Stewart demonstrated making marshmallows on her TV show and it looked easy. They came out great and taste marvelous. I mixed in Wilton red food color paste at the end before putting the batch in the pan because I thought the plain white was boring. This treat is perfect for those watching their cholesterol because it has 0 fat calories! Another recipe I tried was the MS mini fruitcakes and they were so tasty and easy. The recipe did use a whole bottle (a small one) of apricot brandy. I'm not a drinker, so I was surprised that I liked it. You can find both recipes on the Martha Stewart website. Sorry, I forgot to take a picture of the fruitcake and now they have been given away or eaten. The bottom photo shows how I packaged the marshmallows in MS boxes. I can never resist buying the wide ribbons from Ben Franklin Crafts. Each wide roll has so much yardage (to use as a garland on your tree) at a fabulous price. I think they are a bargain for crafters, particularly if you need to make multiples of a card or decoration. Anyway, after vowing not to buy more ribbon rolls this year, I broke down and bought some. 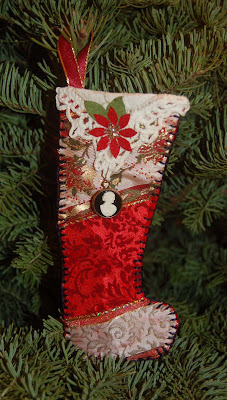 This stocking ornament uses three ribbons, a crocheted doily (a stained donation from an aunt), a Hero Arts felt poinsettia, and a plastic cameo charm (a freebie from a collectible shop). Besides the fact that this ornament can hold a small gift, I like that I made use of Xmas ribbons in a different way and recycled what others were going to throw away. Ornaments are perfect ways to preserve a memory because they are cherished and put on display once a year. Be sure to tell your children the story behind the ornaments so they will pass them on to the next generation. (Instructions and a template for this ornament will be on our craft club website, www.bfcraftclub.com), as soon as possible. Drum roll please............the winner of our Christmas giveaway is.........LORNA!!!!!!!!! Thank you to all who entered. We appreciated all the informative comments. Because so many of you entered this contest and because it's the holiday season, we pulled 5 more names......Bel Adcock, faithatuabc, scrapnhawaii, JanBond, and tracizuni. These five winners will receive a $10 BFC gift card. Lorna and the five other winners you need to send us your mailing address so we can mail you your prizes. Send your address to (contact@bfcraftclub.com). 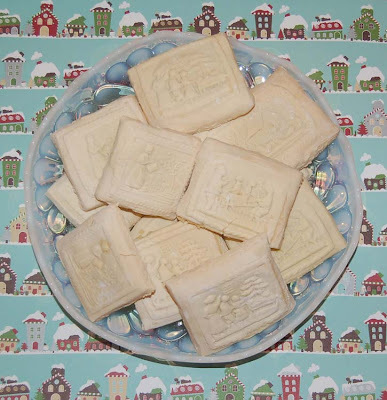 For the last three Christmases I have been trying to perfect a Springerle cookie recipe for my neighbor. This year he said I got it almost perfect except this recipe didn't have the anise seeds in it. The hardest part was getting the crunchy outside texture but keeping the cookie chewy inside. Another difficulty I had in previous years was finding the mold and a dough that wouldn't stick to it. A company called House on the Hill sold the molds and provided a recipe. Next year I plan to make the cookies thinner and add more anise flavoring and seeds. It's fun doing this project each year and it helps my elderly neighbor remember the taste of his childhood favorite Xmas cookie. Isn't it interesting that many of our holiday memories revolve around food? That's why it's so important to keep traditions alive. Bake something good today...make a memory! I wish I could say that this was my idea, but I got the project from Martha Stewart. 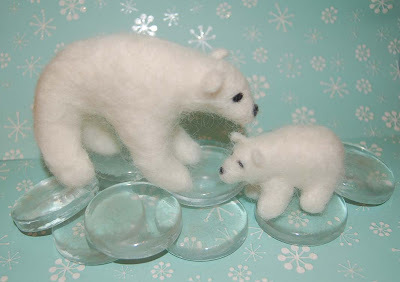 The large needle-felted polar bear was on her website (12/3/09) and possibly in her magazine. The baby cub was my creation using a single pipecleaner and wool fleece (available at some BFC stores). The large glass pebbles and the felting tools are at Ben Franklin Crafts too. These felt animals are lightweight so they would make good ornaments. I'm thinking of making some sheep using black pipecleaners as the base so that the legs would not need to be felted. I will try to get some directions on the craft club website (www.bfcraftclub.com) ...... I know, I know, I haven't posted the instructions for the shaker card holder yet....I will.....soon. I'm into my cookie baking mode and that's time consuming. I'm excited because my Springerle cookies may actually come out right this year. Don't forget to enter our BFC craft club blog contest giveaway. (See earlier post for information.) The deadline is midnight TONIGHT! !!!!!! CONTEST TIME! !!!!!! To win the items pictured above, leave me a comment (by midnight of December 10, 2009) telling me your most useful crafting tool or favorite craft item from Ben Franklin Crafts. You may enter only one time. The winner will be selected by a random drawing of the names of those who left a comment on THIS blog post. It is important that your comment include some way of identifying you so we can contact you. We have the e-mail addresses of craft club members. I will try to announce the winner by the 12th of December. Oh, if you click on the photo you can see the prizes more clearly. 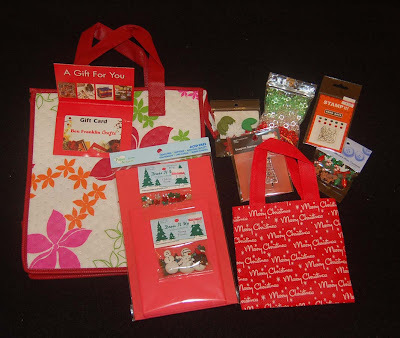 Besides the $25 gift card, there are embellishments (including an assortment of red,green, and white dew drops), a hot/cold insulated Hawaiian print bag, rubber stamps, and a pack of red cards with envelopes. Good luck to all! Enter NOW! Please be patient if you are waiting for the contest to begin. I need to get a couple more prize items and photograph them. I will try to get the information about the contest posted by tomorrow. In the meantime, think about what your favorite crafting tool is or the best craft item you've purchased from Ben Franklin Crafts. To enter the contest you will need to submit this information to the comment box on my blog. Yesterday I was in Honolulu and had a chance to do a little shopping at our Craft in the City store on Bishop St. Pictured below are some of the goodies I found there. The store had the latest Spellbinder's Nestibles, a system that works with the Big Shot machine to cut and emboss basic and fancy edge shapes. Also shown from the store are some of the great K and Co. and Colorbok rub-on and sticker sets. I was impressed with the neatness and organization of the store. 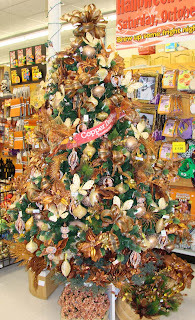 For a tiny store there is a great assortment of our most popular craft items including a terrific selection of Christmas items. (I bought a blinking snowflake necklace and penguin Xmas socks for me.) Well, please check back to learn how to enter our Christmas giveaway contest (includes a $25 gift card). I wanted to make some shaker gift/money holders that didn't involve cutting foam pieces with the Sizzix. I discovered that I could make simple holders using cardstock and cutting the window out with a Coluzzle template. On the back of the holder I taped on vellum paper with Merikan tape to make a pocket for the money or card. Inside the window I glued acetate and put a rubber-stamped card over the loose snowflakes. I will write up the project and include a template on our website (http://www.bfcraftclub.com/) sometime this week. The second photo shows the back of the two holders plus the inside of a previously shown card holder. 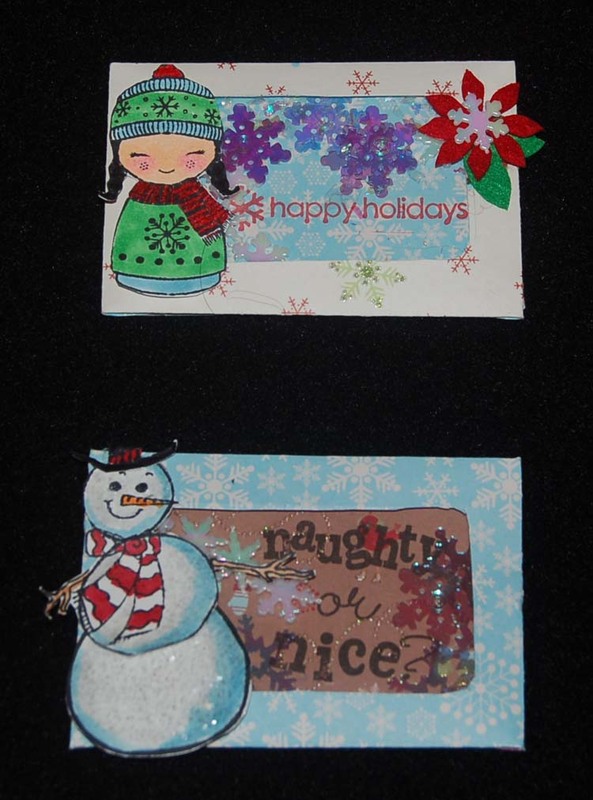 Notice the MS snowflake punched border that was used to hold the card. If you are like me and clueless as to what to give nieces and nephews, make some of these holders and include money or gift cards. You'll save yourself some major headaches. I hope you all had a good Turkey Day! I sure gobbled up more than my share of Thanksgiving calories. We're taking a break before going on to the pie......sigh! Black Friday is usually the start of my shopping panic. This is the day I realize that I need to get the gifts in the mail by next week, and that includes baking some cookies. As you see in the photo above I've begun cheating and buying cookie boxes. There are only so many things I can craft before the mailing deadline so I feel that if I at least decorate the boxes with a few embellishments that will show some effort. Besides the super cute and inexpensive treat boxes, I found some other mailing/wrapping helpers at Ben Franklin Crafts. I love the round ornament boxes which are perfect for wrapping handmade jewelry to hang on the tree. For some of the young guys on my gift list (who wouldn't appreciate handmade gift/money holders), I think I will use the well- made Gerson felt holders...what a bargain! I bought the Little Pot Pals for my boys so that they can feel the joy of being creative this holiday weekend. I think no one is too old or too cool to craft. The kits come complete (a super buy) and are adorable. 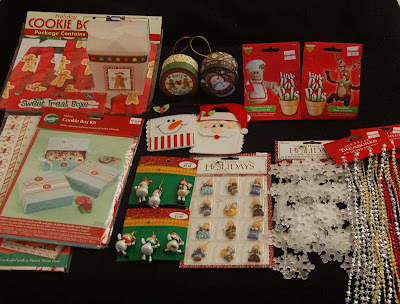 I found a bunch of miniature ornaments from Darice (resin angels) and Gerson (jointed snowmen and santas) which are lightweight and highly detailed. 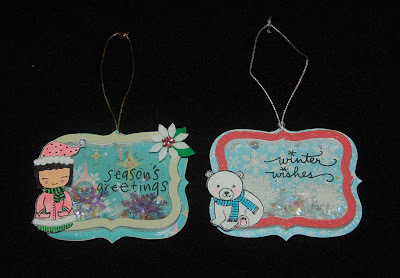 Their low price makes it possible to incorporate them onto a card or tag. The strands of frosted snowflakes and little heart, star or flower beads were not purchased for decorating the tree. I plan to cut apart the snowflakes and use them for gift tags by writing the names with slick writers. The other strands are not going to be used this Christmas but will adorn Valentine cards or cut apart to fill Fourth of July/Easter shaker cards. I hope I've given you some good shopping ideas. Don't forget tomorrow there are TWO 40% off coupons for Ben Franklin Crafts, one at 7-9 in the morning and the other for 7-9 in the evening. See you there. Have a bargain-filled Black Friday shopping day! I just had to tell you about the three terrific new books I've discovered. They are all jewelry books; any of them would make excellent gifts for your crafty jewelry friends. The top book in the photo is written by Jane Dickerson and has so many great projects that I put Post-It tabs on almost every page. Dickerson's simple and elegant style incorporates lots of chains and earthy colors. There are a few projects that have ocean colored glass or ceramic beads that would make them ideal for Hawaii. 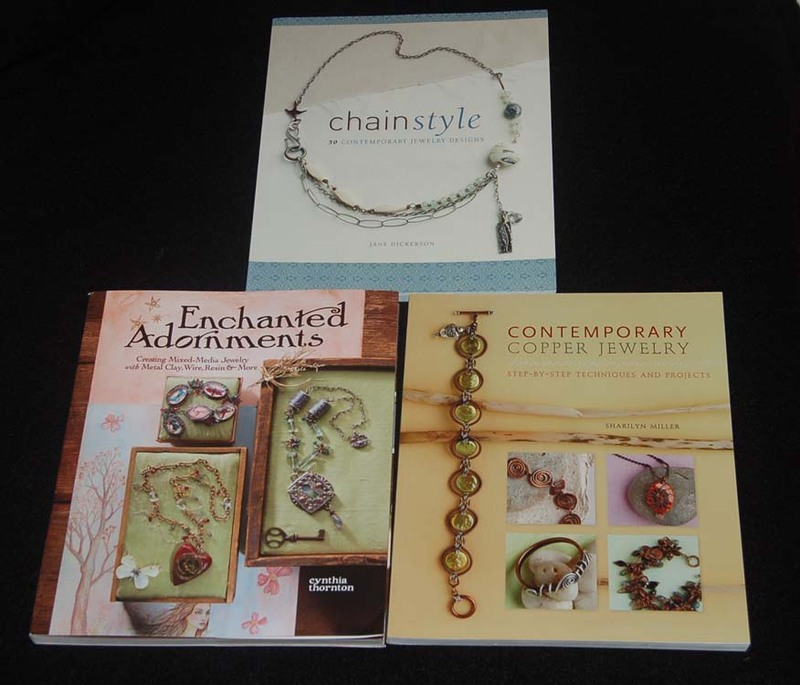 Sharilyn Miller's book, Contemporary Copper Jewelry, is a super book for jewelry artists who are thrilled by the recent popularity of copper in jewelry making. Copper's malleability and warm color make it a beautiful wire working medium alone or with gemstones and other metals. I especially liked the projects Miller designed with brass, silver and copper and I thought she did an exceptional job of showing how to wire wrap gemstones so that the wire is also part of the design. Enchanted Adornments by Cynthia Thornton is truly an enchanted book that is filled with lovely drawings, captivating stories, and multi-media projects that seem to have been made by an artistic fairy. I love this book so much. This is definitely the book that I wish I had written and I fantasize writing a book similar to this one sometime in the future. If you want to learn new techniques and be enchanted by a creative mind you must obtain and read this book. I am often asked where my inspiration for my jewelry projects come from and I honestly can say my best ideas are initiated by looking at the work of others. I scrutinize books and magazines to determine what designs appeal to me and which ones won't be too tedious. I am also drawn to certain shapes and colors. Many times a new purchase or rummaging through my bead stash will give rise to a unique idea. Even TV shows have provided me with current jewelry style ideas. (Ugly Betty and Bones are two series in which the actresses wear eye-catching jewelry.) Anyway, even though you may not find these three books on the BFC book shelf, I think that you will be wise to buy them if you do see them for sale. When I saw these Beyond Beautiful beads at Ben Franklin Crafts I knew I had to make some winter wonder jewelry. 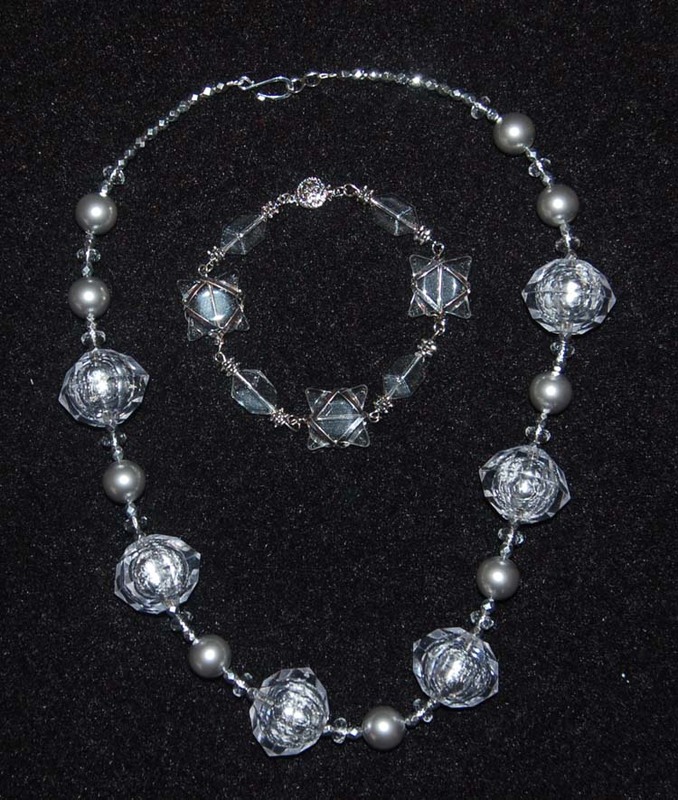 The large beads on the necklace are foil lined faceted plastic so they sparkle like glass but are not heavy. 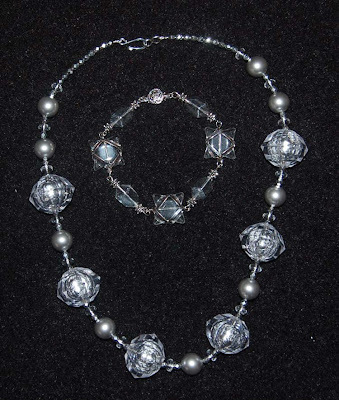 The other beads used for this party glam-girl necklace are silver glass pearls, faceted clear glass rondelles, and faceted silver fire polished beads. The complete instructions and supply list for the necklace will appear on our craft club website (www.bfcraftclub@aol.com). I decided that the necklace needed a coordinating bracelet so I selected a strand of Beyond Beautiful beads. This strand happened to be made up of beads wired together (unlike most of the other strands which are strung on monofilament) so making the bracelet was a snap. I just added a clasp and it was done! I think this set will be perfect to wear to holiday gatherings. To me it has a vintage 60's feel to it.....where are my gloves and lucite purse? I had to laugh when I saw these two cards side by side. They really represent the way I feel about the two upcoming holidays. To me, Thanksgiving has always been about appreciating your blessings in a quiet, introspective way. Christmas, on the other hand, is a time for kids (big ones,too) to get their wishes fulfilled in an over-the-top, sugary, abundance. The autumn card was made simply by folding an 8-1/2x11 neutral cardstock into four parts and cutting off the upper right quadrant. Then I cut a window in the two layers of the card front. A Mountain Idea skeleton leaf was lightly glued between a slightly translucent vellum paper (back) and a translucent vellum paper (front). The vellum sandwich was then taped into the card window. The word autumn was then stamped on the front of the card. 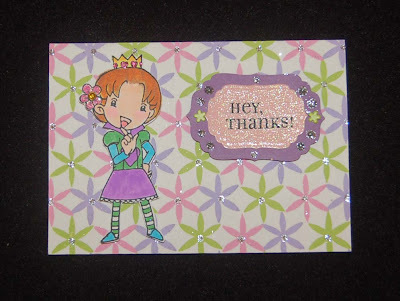 The super embellished card is gaudy but cheerful. My favorite part is the gingerbread man that was made by stamping the image onto a piece of cork sheet and decorated with glitter (use white drying glue) and Stickles. 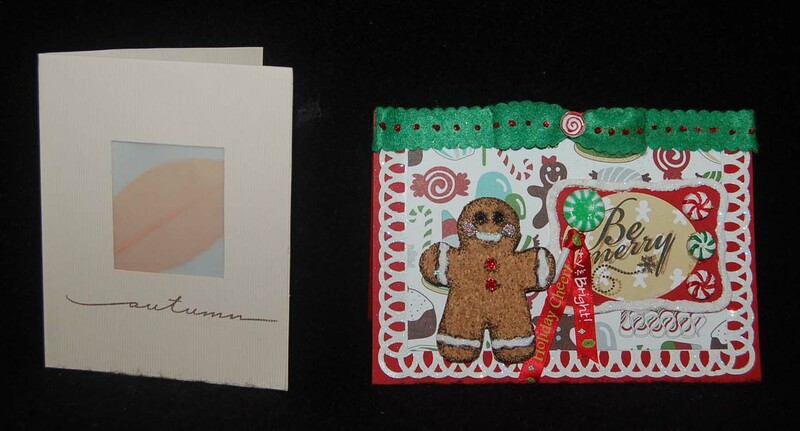 I also think the glittered punched loops really give the card a feel of icing on a gingerbread house. I found that punching one loop corner first and then doing the edges and then another corner is easier than doing the corners first and trying to line up the in-between loops. The scalloped felt ribbon (Martha Stewart) was embellished with Stickles and a mini ornament with the hanger snipped off. Right now in Ben Franklin Crafts there are lots of mini candy ornaments that can work well on a card like this. 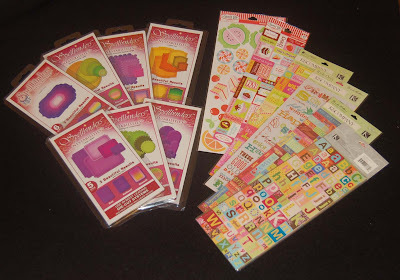 The American Crafts company has designed a glorious array of 'sweet ' papers (available at BFC) with foil and glitter accents which should inspire you to craft, craft, craft! Click on the photo if you want to see the details on the cards. Thank you for visiting and I hope you'll come back soon! Shopping at Ben Franklin Crafts is always fun because you never know what goodies.you'll find. On Monday I happened to pop into the Mapunapuna store and found a great McGill cupcake punch. The punch is much larger than the Martha Stewart one and punches out additional pieces ( a little star, heart and candle) to decorate the punched out cupcake. This punch will make a great gift for a cupcake loving crafter. I also purchased two Martha Stewart felt ribbon packages. 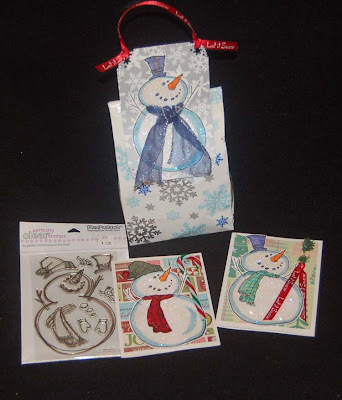 The white snowflake one is so delicate and will add beautiful texture to cards, tags or scrapbook pages. I think the red, white, and green scalloped felt ribbons match well with the vintage-looking Christmas decorative paper that are in the stores now. The other items in the photo are what I term stocking stuffers, but actually I bought them to put in gift baskets of home baked goodies and other small items. The magnetic shopping list pads are invaluable at this time of the year and the small Hello Kitty items are mini calendars that I picked up by the Hilo BFC cash register. The small size of the calendars makes them perfect to put in a purse or set up near your computer. I'm trying to think of a way to incorporate the calendars into Xmas cards as a small appreciation gift. I hope you'll visit the Ben Franklin Crafts stores often this season to find unexpected decorating and crafting goodies. My husband returned from Japan and he brought back a bunch of Copic pens with a storage case. I'm so-o-o-o lucky! Maybe you'll see an improvement in my coloring. In any case, you know I'll be having fun playing with my new pens. The photo below shows a shaker ornament attached to a card. Slipping the hanging cord through the center of the bow allows the recipient to remove the ornament from the card and hang it on a tree or wreath. I used wire that I sometimes remove from wired ribbon and used it to tie the bow. Another skinnier ribbon is tied over the center of the bow and the entire bow is taped to the card. The little cookies and cookie cutters in the shaker box are from Dress It Up. The Santa's Cookies sticker is from American Crafts as are the gingerbread men and cookie decorative paper. I plan to make lots of cards similar to this one for those friends with whom I don't exchange gifts, but to whom I still want to send something special to let them know their friendship is apprcciated. The top two gift card holders are Xmas versions of the one I made for Halloween. I used the Sizzix border frame on a thin foam sheet to make the well for the snowflakes and fake snow. Then I glued another frame made from cardstock onto a piece of acetate. Once the glue was dry, I cut around the acetate, put the snowflakes in the shaker and glued the acetate down onto the foam. The bottom two shakers were made into ornaments because I used a fatter foam sheet to allow for thicker shaker fillers. The thicker foam is a bit hard to cut but if you press as you cut it will go through the Big Shot machine. Perhaps later I'll make a card and embellish it with a shaker ornament that the recipient can remove from the card and hang on a tree. The cute polar bear was made from an Imaginesce rubber stamp image that was flocked. The girl with the cap is a Hero Arts stamp image with the fur trim flocked.The felt flowers are also from Hero Arts. Be sure to stamp the words BEFORE assembling the shaker box frame. The polar bears are on a background of Imaginesce paper and the girls with the caps are on K and Co. paper. 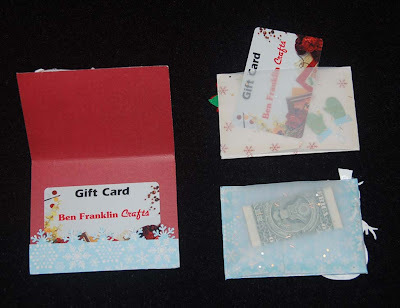 I plan to make lots of the gift card holders because all of my crafty friends are getting Ben Franklin Crafts gift cards this year and craft magazine subscriptions. I've decided that I have unusual taste in gifts so I won't give anything this year that requires choosing a color or style. Oh, one last thing about Christmas shaker cards.....check out Ben Franklin Crafts mini-tree trimming section for miniature items to put in your shaker box cards....so many cute, tiny Christmas items! 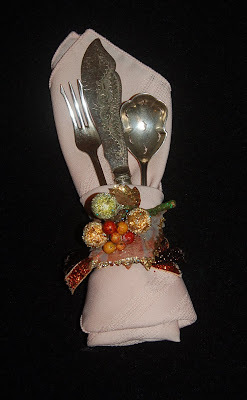 The photo shows a quickie napkin ring made with a disassembled autumn pick glued onto a ribbon that is tied around the napkin. The utensils don't look like the normal ones because they are from my collection of antique oddities. The three pronged fork is a lemon fork (I originally thought it was an olive fork). The knife is an engraved fish knife and the spoon is probably for nuts (or possibly a spoon for something that needs to be drained because the spoon has holes). I do believe all of these utensils are from the Victorian era (1890-1920) because it was a time when there were separate utensils for serving or eating every single food item. I find it interesting and challenging to discover strange silverware and learn their usage. With the BIG feast coming up I need to start polishing and find recipes that allow me to use all the wacky utensils I've collected. Just about this time every year I start to get depressed about all the work I still need to do to prepare for the holiday season. Sometimes I think I'll just run away. Maybe it's because many of the members my immediate family have passed away or have moved away. It's hard to get excited about cooking or shopping or even crafting when there is so much to do and you have to do it all by yourself. 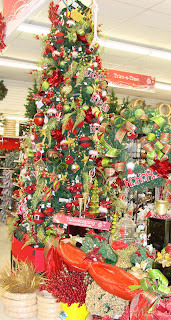 At times like this it helps me to go to Ben Franklin Crafts and see all the beautiful displays. This year the Hilo store crew really outdid themselves with the decorating. I love just going there and staring at the Christmas trees. 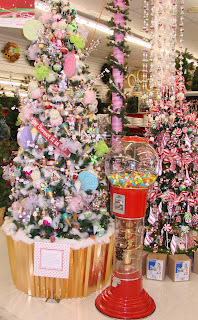 Since we don't have a tree festival here, I think children especially would love visiting the store to see the magic that has been created by our elves. After a visual pick me up (and some shopping, LOL) I feel refreshed so I will now get lost in my craft room until someone shouts, "What's for dinner mom?" This is not a very good photo of the mini album but it really is quite attractive .....if I do say so myself...LOL! The directions for this project are on our website (www.bfcraftclub@aol.com). Because we don't have a fall season in Hawaii, I always envy those who see the beauty of autumn leaves in their yard, except when I think of the raking. 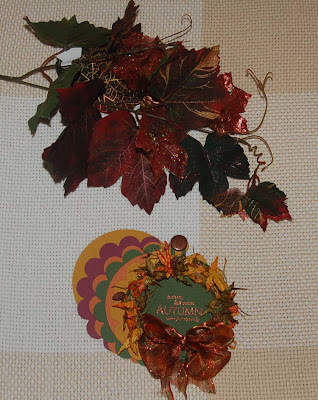 I guess I should be happy to be able to purchase beautiful artificial fall folliage from Ben Franklin Crafts. In this photo you can see two examples of leaf picks and wired leaves available at the store. Click on the photo to enlarge it. I had the coil of wired leaves on my craft table and it inspired me to make the cover of the mini album. These days I am too lazy to make a whole large sized album but I do want to freeze some memories in time. This year for the first time in ages (since he went off to college) my older son will be joining us for Thanksgiving dinner. Now that is definitely a reason to take millions pictures, so I made an expandable (yet mini) album. 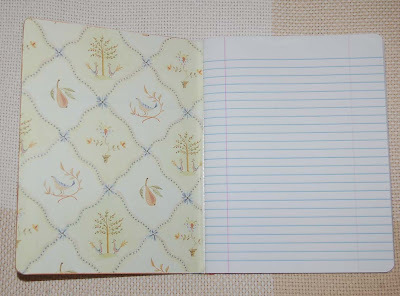 If I decide I need to do some journaling, I'll put some pockets on a few pages to hold my words. Don't let the holiday season pass without at least a mini collection of memories. 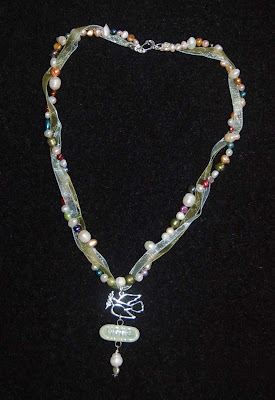 Here is the first of my projects made using the Symbolize jewelry line and the multi-colored pearls from Ben Franklin Crafts Bead Shoppe. This necklace was whipped up in about an hour so it would be a great one to make for Christmas gifts and to sell at craft fairs. I think the pearl strands are going to be on sale soon but even at the regular price they are a bargain. I am happy with the way that this necklace turned out because it conveys a message and has a hippie, free spirit feel to it. The instructions for this project will appear on our website (www.bfcraftclub@aol.com) by next week. Click on the photo to see a close-up view. Thanks for visiting and come back again to see my autumn mini album. I finally bought the loopy Martha Stewart punches (a set of two). (I think the real name of the punch is 'rings'.) 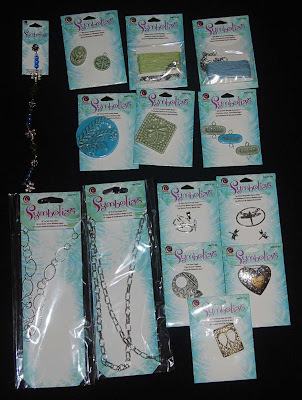 Although I went to Ben Franklin Crafts to buy just that set, of course my crafty eyes spied the snowflake set that punches a border of snowflakes all the way around a rectangle........so that set came home with me too. 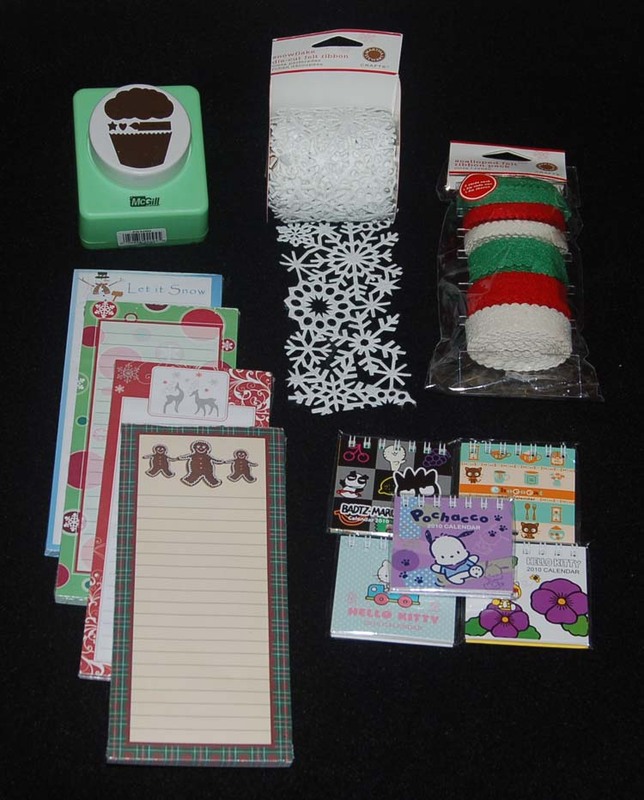 I have plans to use the snowflake set with my snowman rubber stamps and the loopy set should look good with my gingerbread house/men embellishments because the loops look like icing. The items that made my heart beat faster during this shopping trip were the new 'Symbolize' line of jewelry parts from Cousins (see top photo). I absolutely love the components and I see so many possibilities for making beautiful gifts for the women and girls on my Xmas list. Also new to the store were millifiore glass bead strands and mixed pearl strands. Both of these types of bead strands were very inexpensive and seemed to match well with the Symbolize line. 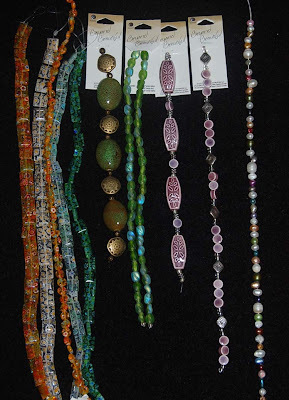 BFC Bead Shoppes have brought in new Beyond Beautiful bead strands. The variety and colors of these beads makes me so excited to get started with my Christmas creations. Thanks for visiting this blog site. Please come again to see what I've produced from these supplies. This is another craft book you might be interested in purchasing. 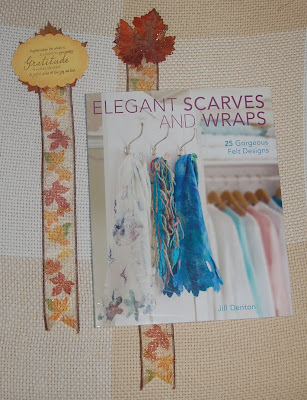 Elegant Scarves and Wraps by Jill Denton is a very creative instructional book that shows you how to make the most beautiful, luscious scarves and delicate, unique cozy wraps for evening or day wear. The techniques of felting these nature inspired art pieces are fully explained and illustrated in this book. Most of the projects in this book are suitable for Hawaii's climate because many designs are extremely lightweight. Also in this photo is another book mark I made to celebrate the fall season. I used a sheer ribbon (with the wire removed) and glued (with Fabri Tac) an artificial autumn leaf (wish I had the real thing) to the top. On the back I glued a paper oval with a rubber stamped gratitude saying. Take time to rest and read before the craziness of Christmas crafting begins. Congratulations, Linn! You are the lucky winner of our first candy blog giveaway. Please send your real name and mailing address to our Ben Franklin Craft Club e-mail address: (contact@bfcraftclub.com) If I don't hear from you within a week I will award the prize to another person who entered the contest. I assure you it was a random drawing even though the winner had the same name (different spelling) as the blog LOL. In the future if we decide to have more lucky drawings we will try to let craft club members know about it via e-mail. Our stat counter shows that our blog has many readers but that a good portion of them are not island residents so the gift card may not have been a desirable prize. Hope your Halloween is sweet and spooky! 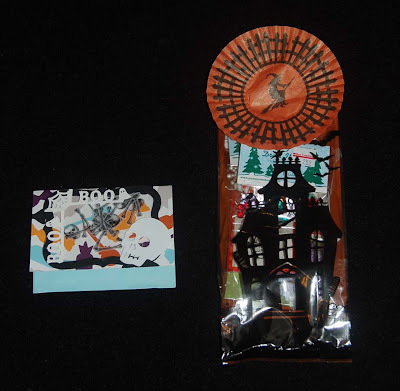 At midnight Oct. 29, 2009 the contest to win a $25 gift card (from Ben Franklin Crafts) and some blog candy, will end. Look at my Oct. 23rd post (scroll down) to find out how to enter the lucky drawing. 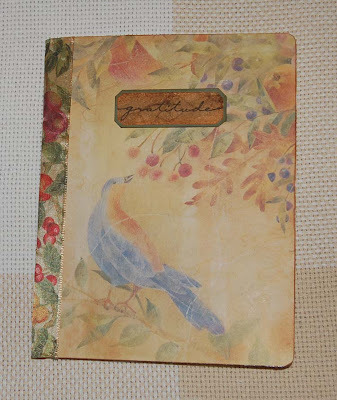 The photo shows a gratitude journal I made for this season of thanks. I've seen so many cute Hello Kitty notebooks on other blog sites and I thought I should give it a try. However, I was reorganizing my paper trays and was drawn to a 12x12 Brenda Walton (K and Co.) purchased years ago that just begged to be used for a journal cover. I guess the color, aged look and New England Pilgrim feel of the design made the paper a good choice for an autumn project. Anyway, the thing I learned from this project was that Fabri-Tac glue is the perfect adhesive for gluing down the paper. I guess the quick drying property of the glue keeps it from wetting the paper and causing puckering. Initially, I was just going to use the glue for attaching the ribbon to the tablet spine. Isn't the ribbon a perfect match for the paper? It wasn't planned; I bought the ribbon for another project. I was very pleased with the end product of this serendipitous project. Happy Autumn Crafting! I just finished reading Dan Brown's new book, The Lost Symbol. Like his other books, it was intriguing, exciting, and informative. While reading it I kept wishing I had a longer, better book mark so I crafted one. The long velvet ribbon (Martha Stewart Christmas 2008) was topped with a cluster of artificial berries and leaves glued on with Fabri-Tac. The bottom of the ribbon was folded into a point and a charm was sewn on. So simple to make and a necessity for a big hardcover book. Why not make holiday bookmarks to give with gift books? 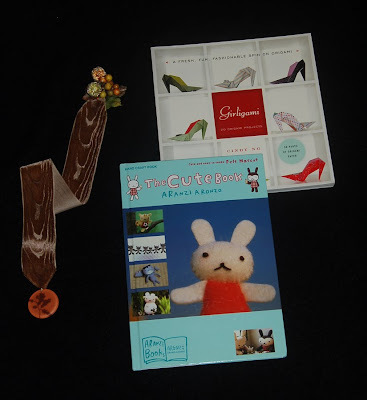 Two craft books that I think would make great gifts are The Cute Book by Aranzi Aronzo and Girligami by Cindy Ng. The Cute Book is filled with instructions for making the sweetest tiny felt animals. Girligami contains the directions for making fun, simple origami cupcakes, shoes, pandas, strawberries, etc. and the paper comes with the book! Yes, there is still time to enter my blog candy giveaway. Look at my Oct. 23rd post for information about it. Someone lucky is going to win that Ben Franklin Crafts gift card! Don't worry there's still time to enter my blog candy giveaway, just leave a comment on the Oct. 23rd blog posting. (Scroll down to the last post.) Hurry and tell your friends to enter too. You have until Wednesday when the contest ends at midnight. Why not pass out non-edible treats to your Halloween party guests? This bracelet is super simple to make, using beading wire and a magnetic clasp. (All supplies are from Ben Franklin Crafts.) Just string two 7" lengths of fire polished beads (one orange and one black with skull beads) and attach them to the clasp with crimps. Wrap the finished bracelet with gauzy ribbon to give it a spooky shrouded mummy look. Placed in a halloween treat bag, this bracelet will surely please young and old trick o' treaters alike. I plan to wear this bracelet on the 31st as my costume...... just this bracelet! Oh my! That would be a horrible trick to play and certainly no treat for anyone. Heh-heh-heh! 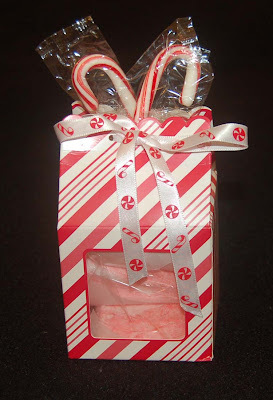 As promised, today begins the Ben Franklin Crafts blog candy giveaway! I'm so excited to see the response. So how does it work? It's easy. All you do is leave me a comment on THIS blog post telling me what made you initially start visiting Lynn's Craft Blog (a friend told you about it, you saw it listed on another blog, you heard about the blog candy, etc.). On Thursday, Oct. 29, 2009 at midnight, the contest will end and all the comments will be placed in a box. One will be selected and the winner of the blog candy will be announced on Halloween. If there are too many entries, I will use a random number generator to select the winner. The winner will have a week to send me an e-mail telling me their name and address so I can send them their prize. 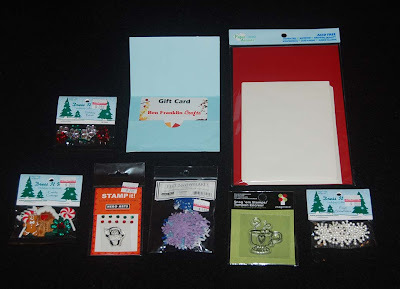 Oh, I almost forgot to mention that besides the embellishments, blank note card set, and clear stamps, the blog candy includes a $25 gift card to Ben Franklin Crafts. Okay, enter now and tell your friends too. If we get a fantastic response, we'll do more blog candy giveaways. From this photo you can tell that my blog title is not referring to making a child (although I do have a terrific nephew named Brad). Yes, Imaginisce has actually made a tool for the home crafter that enables you to make brads (in three sizes) from paper, fabric, and other not-too-thick-thick materials. This tool works somewhat like the fabric covered button makers that a seamstress uses. I have found that scrapbook paper works better than cardstock because of the thickness. Washi paper also works but the fiborous ones may get stuck in the punches so it would be better to use the templates and a scissors. Actually, any soft paper or fabric is best cut first by hand and then put in the brad maker. I do like the speed in which you can make brads using the punches and the satisfaction of using up my pretty scrap paper. As you may be able to see from the second photo, I made brads from ribbons (the ladybug and MS seafoam with glittered edge), leftover Christmas wrapping paper (holographic ones in Hero Arts felt snowflakes), and assorted origami and scrapbook paper. My favorite brad is the large white one that doesn't show well in the photo but is made from an embossed wrapping paper. The paper came off a gift my sister gave me......won't she be surprised to get it back as a brad! Oh, the brads are stuck in a styrofoam block because I coated some of the plain paper brads with liquid glaze and they are drying. One last hint, it's best to use paper with small all over prints because it is a bit difficult (but not impossible) to center a design. Okay, I hope this post wasn't too boring. 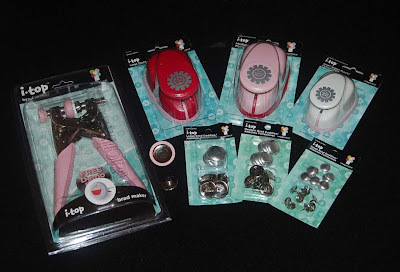 On Friday I will post the details of how to enter and show the blog candy I'm giving away. I've been thinking about having a Ben Franklin Craft Club 'blog candy' lucky drawing for awhile. With Halloween on the way I thought it would be the perfect time to have my first blog candy giveaway. It will start in a few days and the winner will be announced on Halloween. Sometime during the week I will give the specifics and show you the blog candy. The photo you see here shows the gift card holder (the BFC gift card will be part of the candy) and a treat bag with some of the blog candy in it. I had fun making the shaker gift card holder. It was easy to do because I used the Sizzix ornate frame to cut a frame of black foam and one of black cardstock. A piece of acetate was sandwiched and glued between the two frames. The confetti bones (MS) were placed on top of the holder before the windowed frame was glued down. I was able to locate and purchase only the web corner punch (MS)( I guess the side web punch sold out.) so I punched the boo design (MS) on each side of the cobweb. I think it was a happy improvised solution. One thing that I liked about the boo paper punch is that it is designed to punch a long strip but has hinged side wings that fold in making it compact unlike the other Martha Stewart strip punches. If time permits I will write up the instructions for the gift card holder. Oh, the topper for the bag is actually a MS cupcake liner. There were also cute owl Halloween cupcake liners in the same package with the witch ones. Okay, please visit this blog again some time this week so you can find out how to enter the Halloween blog candy lucky drawing. I designed this project to hide secret Halloween candy stashes. Click on the photo to see the details. It looks like a Post-it holder with a pen, but it is really a box for candy so no one will find and eat your personal office supply. I had to back the American Crafts Halloween design cardstock with another plain cardstock sheet so that it would support the Post-it pad. If you glue the two cardstocks together before cutting, you won't have to struggle to position them later. I will try to post the pattern for the box and the instructions for the project onto our website (http://www.bfcraftclub.com/) at least before Halloween. This same project can be adapted to other occasions simply by changing the cardstock and using different Dress It Up buttons. Delight a favorite teacher with one of these treat boxes. For a party favor/place card, you can place extra Post-it pads in the box instead of candy and write a guest's name on the first sheet. Happy Halloween Crafting! These simple treat containers are definitely no trick to make. The purchased orange take-out container was decorated in a snap by simply using Fabri-Tac to adhere the Martha Stewart felt cobweb ribbon to the box. Spiders were punched out of black paper and glittered before gluing them down. 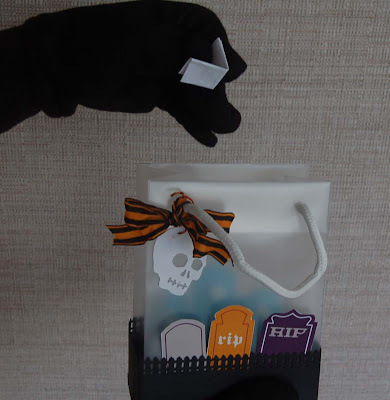 The graveyard treat bag started with a Heiko frosted bag that was decorated with a punched (Martha Stewart picket fence) strip of black paper and tombstones cut from American Craft 12x12 paper. The skull tag was punched from white glitter paper using Martha Stewart's terrific new paper puncher. Wired ribbon was used on both projects so that it could be shaped. 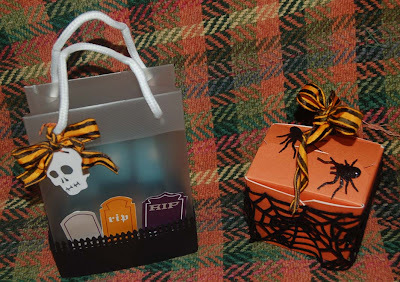 These treat containers are so simple to make that you can easily make dozens for your child's classmates or as party favors for your spooky Halloween party. Give them a try and I'm sure that you and the recipients will be delighted. Although I thought that I had exhausted my Halloween creative urges, I took a look at the new Martha Stewart punches and I could not keep them out of my shopping basket. The new larger more realistic spider will be good with the web punch and the large skull punch I plan to use with the confetti bones. The Martha Stewart spider web felt ribbon roll and cupcake liners quickly went into my shopping basket because I can think of so many ways to use them. (Maybe the liners will actually be used for cupcakes or muffins but I like the graffic look of the design and the translucency of the paper so I will probably incorporate them into cards or treat bags. Hero Arts now has cute single clear Halloween (Christmas and all occasion stamps, too) that come with rhinestones so I had to buy a few of those. Oh, as I do every year, I picked up a several packages of Dress It Up decorative Halloween buttons because they are a great way to embellish my crafts with minimal expense. (The shanks can easily be cut off the buttons if you want to glue them down. The 12 x12 paper in the background is from American Crafts. At first I thought they were odd colored but now I like the subdued look because they will allow the embellishments to stand out. I still have a couple of weeks to make treat bags in time for Halloween, but I better get going. Hope you'll get going, too.....to Ben Franklin Crafts for all your Halloween craft supplies. I know the birthday gifts we mailed (today) to the sweet Ms. Traci won't get there on time for her special day, so I thought I'd show one of them to her on this blog. She is a Hello Kitty fan, too so I made her this local looking card (she is temporarily transplanted in Calif.) to match the photo of her eating shave ice. Actually seeing the cute photo of her on our computer screen (we have one of those screens with random pictures generated from our photo files) inspired my creation of the photo frame. The photo is not really blurry but I put a piece of frosted vellum over it just in case Traci would rather not be on my blog in her swim suit. The frame (the only part of the gift that I made besides the card) started with a basic acrylic stand up frame. I glued on a 'SWEET' DCWV chipboard which I decorated with shave ice cones (actually ice cream cones with Mizuhiki cords for straws) from Jesse James Beads. The ribbon around the frame is from Martha Stewart and the flowers are from Prima. The shave ice cone on the card was made from a Rubber Stamp Plantation design that was colored and embellished with Christmas snow (iridescent pieces of cellophane). 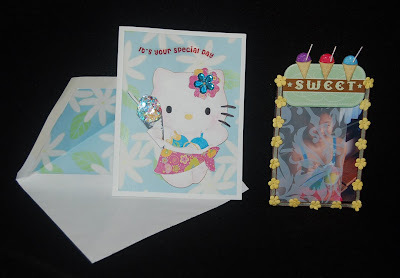 I used a Sizzix die for Hello Kitty and Allure vellum paper for the background of the card. Traci, I hope you like your gifts and that you have a great birthday tomorrow! For some students, October is the month when school photos get distributed. Because it is also the month for Halloween fun, I wanted to make a project to combine the two events. The new Hero Arts clear stamp set with an Owl-ween theme was a too-cute-to-pass-up item I purchased at Ben Franklin Crafts. Not feeling like coloring, I stamped the pirate design on a printed paper. I couldn't find a brad that matched the ribbon so I copper glittered some orange brads. You can either hang the frame up or put a magnet behind it to display on a refrigerator. I think the torn opening for the photo is the best part of the project. 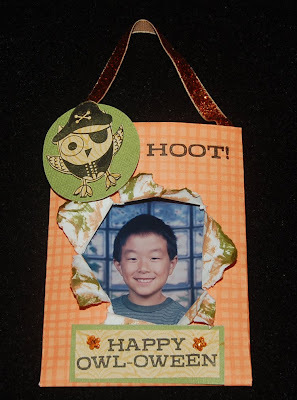 Complete directions for this Owl-ween photo frame will be posted at (http://www.bfcraftclub.com/) . Thank you for visiting this blog site. Please stop by again for more crafting ideas. 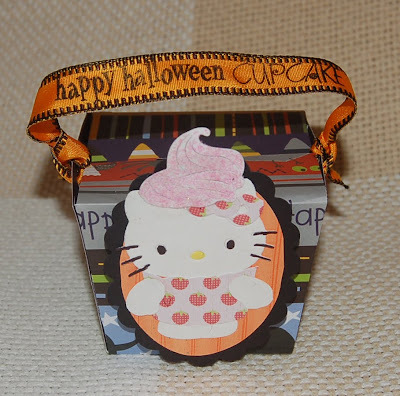 I wanted to make something cute for Halloween and so I looked in my Hello Kitty Sizzix drawer. I thought about making a sweet costume for Mimi, maybe a pumpkin. (My son actually went trick-o-treating as a pumpkin when he was two......I've got the blackmail photos to prove it.....so-o-o cute!) Then I thought about cupcakes (I'm still thinking about them) and looked for my Sizzlet sweet treats die cutter. The cupcake image was just the right size for the Hello Kitty Sizzlet image. I think that the sweet Hello Kitty in a cupcake costume on a take-out box made from wonky Imaginisce Halloween cardstock is rather humorous because it is an unlikely pairing. The finishing touch was finding the right ribbon to stamp on with 'Happy Halloween Cupcake' (which can be interpreted two different ways). Of course, a treat box like this must be filled with a deliciously decorated cupcake! The full instructions for this project will appear on our Ben Franklin Craft Club website (http://www.bfcraftclub.com/) . Sending you sweet treat thoughts for stopping by and reading this blog. I'm never quite sure whether it is appropriate to make a sympathy card. Although it may show heartfelt feelings, I worry that it may look too homemade and possibly tacky. The recent death of a dear aunty (who was a relative in my heart but not by blood), prompted me to design a quiet, elegant sympathy card which would match her spirit. I tried many Asian papers and blank cards together and finally settled on a Hero Arts crepe blank card and Kodomo leaf print vellum paper. 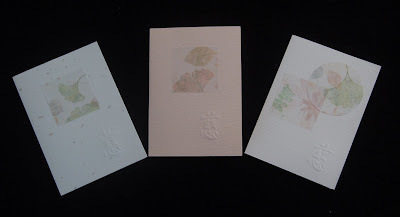 By simply embossing the 'sympathy' symbol (Dreamweaver brass stencil) on the lower right side of the card and taping (use vellum tape) a punched out square of leaf print vellum, the card was made in 10 minutes! Finding the right elements for the card took the most time, but I think I achieved the look I was after. I made two extra cards since I had my supplies out. Click on the photo to enlarge it and see the embossed symbol. Thank you for reading my blog and I hope you gained something from it.